All my work is made from coils or ropes of clay. The slow method of working, paddling and scraping the surface allows the form to be modified whilst building. Each pot is therefore very individual; it has a unique character, with a distinct textural surface. Boxes, bottles and bowls are my reference point. It is important that the work I make can have some function, albeit only to hold a single flower or stem of grass. Using reclaimed wood for lids, boxes and caddies form a large part of the work that I produce. 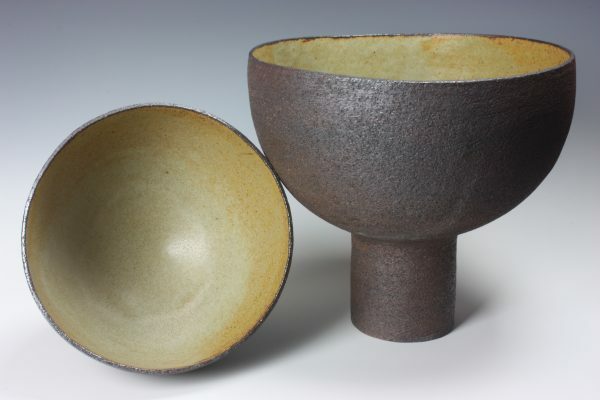 The pots are glazed with simple ash glazes from the ashes of different woods; traditional Shino glaze is also used to give warm reds and oranges. Finally the pots are fired in a wood fuelled kiln to over 1300°c, pots taken from a wood fired kiln are imbued with a warmth and beauty. You can follow the passage of the river of fire by the deposited ash; look closer and a whole landscape of subtle colours are revealed. I can fire the one cubic metre kiln by myself and firings last for about twelve or thirteen hours, using pallets and scrap timber as fuel. Like the making of the work, firing is slow, quiet, rhythmic and a time for contemplation. The heat and effort of stoking are physically demanding and the two days the kiln takes to cool offers a welcome rest.